The over 300 year old Kiso Natural Cypress Forest where Forest Bathing originated. Wrap yourself up in the soothing sounds of the forest. The upstream forest which nurtures the Tottori Sand Dunes"Chizu; where the breezes waft through the forests, the town to escape to"
“The Forest of Arts through our Five Senses” where the forest brings peace to our hearts and the sculptures inspires excitement in our minds. Let's go out to feel the blessings of nature. "The forest to recharge your energy and your spirit; Forest Therapy Base, Kitago Town in Nichinan City"
Okutama Forest, Forest Therapy Base with Giant Healing Trees. The town has 5 Therapy Roads. 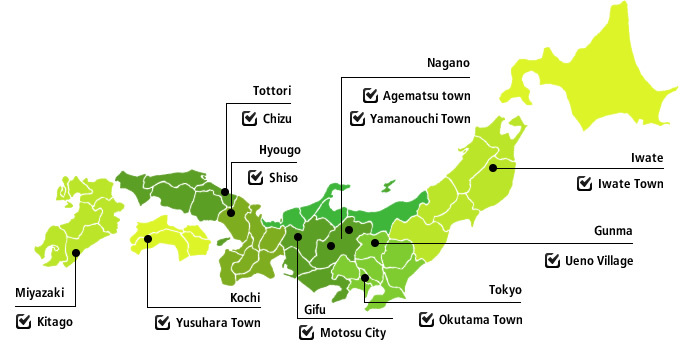 We are the first Forest Therapy Base approved in Hyogo Prefecture! Therapy Roads above the clouds / "Tour around lakes glistening in green" / The primeval forests of Shiga Kogen. Matsubara Town Clinic : Dr. Miki Gibo and the staff will help you maximize the "Power of the Forest" for your health.